1. Remove the shift lever assembly (see page 14-222). 2. Release the lock tabs (A) retaining the shift lock solenoid using thin-bladed screwdrivers. 3. Insert a 6.0 mm (0.24 in) pin (A) into the guide hole (B) ('08-09 models), and push the shift lock solenoid (C) out. 4. Disconnect the shift lock solenoid connector (D). 5. 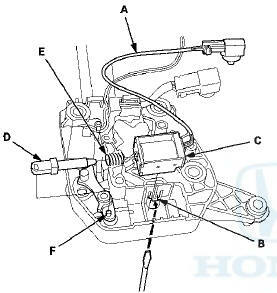 Replace the shift lock solenoid, the solenoid plunger (E), and the plunger spring (F) assembly. 6. Apply silicone grease to the tip (G) of the shift lock stop and the solenoid plunger. 7. Connect the shift lock solenoid connector. 8. Install the shift lock solenoid by aligning the joint of the shift lock solenoid plunger with the tip of the shift lock stop, then push the shift lock solenoid into the shift lever securely. 9. Install the shift lever assembly (see page 14-224). 2. Remove the A/T gear position indicator panel from the shift lever (see page 14-228). 3. Remove the shift lock solenoid harness (A) from the harness guides. 4. Release the lock tab (B) retaining the shift lock solenoid using a thin-bladed screwdriver. 5. 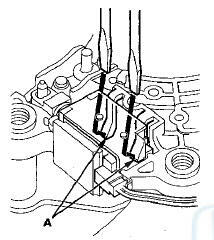 Replace the shift lock solenoid (C), the solenoid plunger (D), and the plunger spring (E) assembly. 6. Apply silicone grease to the tip (F) of the shift lock stop and the solenoid plunger. 7. Install the shift lock solenoid by aligning the joint of the shift lock solenoid plunger with the tip of the shift lock stop, then push the shift lock solenoid into the shift lever securely. 8. Install the shift lock solenoid harness in the harness guides. 9. Install the A/T gear position indicator panel on the shift lever (see page 14-228). 10. Install the shift lever assembly (see page 14-228).